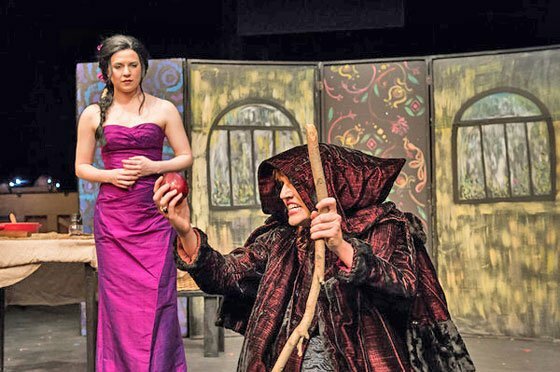 The black box Plaza Theatre at the BCA witnessed the world premiere of Polina Nazaykinskaya’s chamber opera The Magic Mirror Thursday night, presented by Juventas Music which has been presenting new music from young composers since 2005. Nazaykinskaya, a 26-year-old Russian composer who has received her Masters at Yale, is currently pursuing her Artist’s Diploma. The Magic Mirror is a setting of the Snow White fable, as re-imagined by Pushkin in his story “Tale of the Dead Princess and the Seven Knights.” Like most Americans, I am unfamiliar with the Pushkin version of this story, and perhaps over-familiar with Disney’s. As set by Nazaykinskaya and staged by Erin Huelskamp, the essential difference between the two is in the character of the Evil Queen (Jennifer Weiman) and her complex relationship to the Princess’s mother (Noune Karapetian).The opera opens with a long aria for the Queen, which starts as a lullaby but reaches a pathetic climax as she laments her fatigue and loneliness. The Evil Queen suddenly emerges, removes the life force from the Queen, entraps it in a mirror, and then seduces the King (Andy Papas) by giving him a combination forgetting/love potion. The Evil Queen becomes dementedly obsessed with her appearance, regularly interrogating the mirror (in which the soul of the Queen is trapped) to ensure her beauty is unsurpassed, and upon being told that the Princess is more beautiful than she, plots the Princess’ murder, ordering the maid Chernyafaka (Yelena Dudochkin) to lure her to the forest and kill her. There is a psychologically complex horror at work here, and its unfolding is the most dramatically satisfying element of the opera. Karapetian’s Queen is full of dignity and pathos, while Weiman’s Evil Queen is terrifying, simultaneously repugnant and compelling. 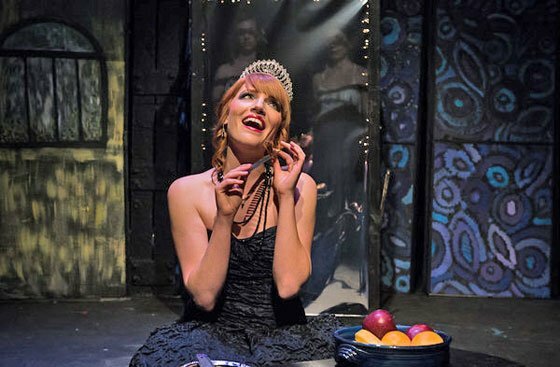 Red-haired, dressed in black dress and with black nail-polish, Weiman’s powerful voice, devouring smile and dramatic fearlessness fill the small space with dread and threat. There are other elements that differ from the Disney version—most notably, we have seven knights, not dwarves, but their role in the plot isn’t much different. Nazaykinskaya exploits this difference by giving us moments of powerful massed male voices, but the knights, like the dwarves, are still a group of men living alone who devote themselves to the Princess. This makes for a somewhat uncomfortable scene where they crowd her after she is discovered—seven full grown men in coarse clothes converging on a small woman in a strapless formal gown conveys a sense of threat, no matter how well-intentioned the group may be. Once we leave the Evil Queen’s initial ascendance to power in the kingdom, The Magic Mirror is somewhat less confident. There is an air of ritual to the piece, which allows us to suspend disbelief when, for example, the Princess and Prince are introduced already in love at the announcement of their engagement. Once we meet the Princess, nearly half way through the opera, there is a lot of exposition to get through in quickly, before the opera ends half an hour later. The piece doesn’t unfold so much as it juxtaposes scene after scene. If we accept that this is a ritual, or a somewhat distanced re-enactment of an already familiar story, that might justify the speed with which plot points go by (I’m thinking the ritual effect of something like Stravinsky’s Oedipus Rex). However, Nazaykinskaya’s music is if anything a nostalgic recollection of the harmonic language of the romantic era, and is structured that way with clear arias and ensembles. The music’s surface promises an opera of emotional immersion, but the dramatic structure provides little room for that to develop. Scored for a small chamber ensemble consisting of flute, clarinet, violin, viola, cello, piano, and pitched and non-pitched percussion, the opera was conducted by Lidiya Yankovskaya. The music often flows along steadily for minutes at a time—even odd-numbered compound rhythms tend to glide by, except in the moments of great conflict. Nazaykinskaya has a deft hand for instrumental color, making use of ponticello strings, bowed cymbals, the combined timbres of piano and vibraphone. The instrumentalists performed fluidly, though perhaps due to the Plaza’s acoustic, there was a lack of depth and separation to the sound. The Magic Mirror is quite conservative in style, lush neo-romanticism with just enough harmonic and melodic piquancy to indicate the piece was written in the 21st century. At moments I was put in mind of brief moments of color in Michael Nyman’s The Man Who Mistook His Wife For A Hat, though Nazaykinskaya’s compositional technique is not at all minimalist. There is some use of leitmotif to organize and dramatize, though at this one listening I did not find it easy to track their appearances. Perhaps there is something traditionally Russian to this style of presentation. The piece is sung in Russian with supertitles; the locale seems to be historically Russian, and the opening night audience was, to gauge by the voices around me, also predominantly so. The production design, by Varvara Sosedova, painted in blue and purple pastels for the forest, simply evoked stylized rural Russia, with pastel colors and with hints of Matisse in its curvilinear elements. 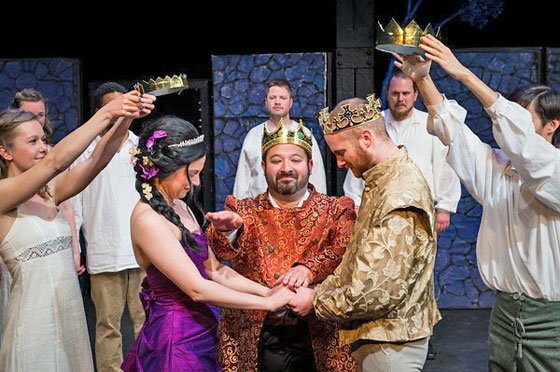 At its best, The Magic Mirror has moments where musical language and dramatic action come together thrillingly: at the decidedly un-Tristanesque potion-drinking by the King; at the Princess’s apparent death; at moments of transition in the engagement celebration. The Prince (Sean Lair) doesn’t sing for us until well into the opera, but his brief triple-time aria as he searches for the Princess struck me as the most “operatic” moment—a sudden passionate and urgent moment that snapped everything into focus. And you would have to be much more of a curmudgeon than I not to be moved by the procession to the wedding of the Prince and Princess at the end. If The Magic Mirror is not quite a major re-interpretation of a popular fable, it is nevertheless an appealing, accessible and occasionally brilliant early work that should be of interest to audiences seeking new takes on traditional opera.